The Republic of the Maldives is an archipelago consisting of 26 atolls, more than 1,000 islands and more than 100 resorts. The various existing resorts are sufficiently costly and far apart to avoid any sense of mass tourism, yet sufficiently close together to permit island-hopping by boat or plane. The government plans to develop 100 more islands as resorts, each with a capacity of between 100 and 200 guests. 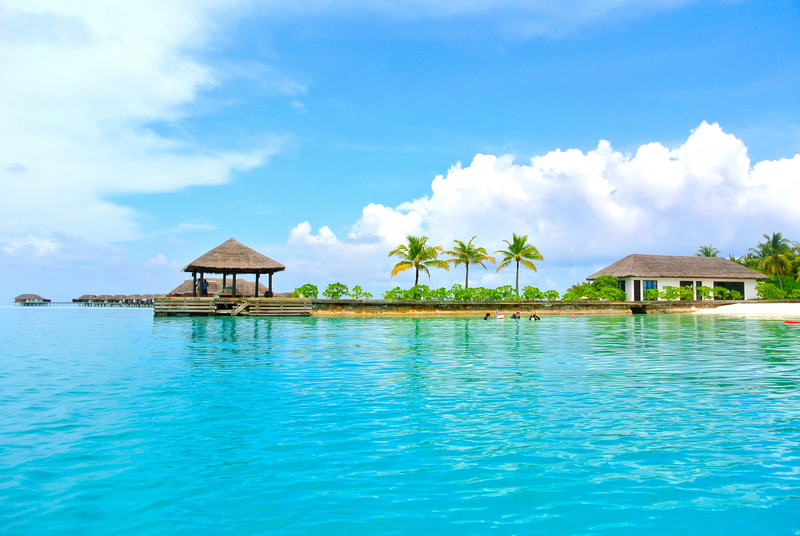 The Maldives has long been regarded as the world’s most luxurious destination. Luxury comes at a price, but for good reason. All sewage has to be processed, all electricity generated, and all water produced by desalination on site. In order to reduce marine plastic pollution, the resorts distribute their own water in glass bottles. Still, garbage is the archipelago’s second biggest export after fish – a sobering fact. It has been calculated that each visitor to the Maldives generates 3.5kg of waste per day. All 10,000 tourists who visit each week ought to be aware of how fragile this earthly paradise is. High season is in January, February and March, the months with the lowest rainfall, although there are few periods of prolonged rainfall throughout the rest of the year. The average temperature is never lower than 25°C and never higher than 32°C, but sunlight filtered through clouds, as in the Caribbean, has an insidious power. Having landed at Malé, I was met by a concierge from the first resort I was due to visit and escorted to a customer lounge. The wait for my speedboat connection was brief and I was soon being whisked to the resort, only 35 minutes away. When the time came to head to my next resort, about 40 minutes from Malé by air, I returned to Malé by boat and transferred to a Trans-Maldivian Airways seaplane. This was noisy (I had brought along foam ear plugs), but the flight allowed me to see several of the islands from above. Each resort has its signature footprint determined by the pattern of its overwater bungalows. The overwater bungalow may have been invented in Tahiti, but it is vernacular resort architecture in the Maldives. All electricity, water and sewage pipes are concealed under the bungalows and travel underneath the jetties on which you walk. That’s not to say that you can’t stay in a beach villa instead. Some people yearn for the feel of sand between their toes as they dash to the water’s edge, and Maldivian sand is typically fine and white. There is a plentiful supply of tuna and reef fish from local fishermen, but anything else needs to be shipped in: fresh fruit and vegetables from India, shellfish from Sri Lanka, molluscs from Tasmania, and wagyu beef from Japan. Bear in mind that alcohol is expensive. Not only does it have to be shipped into the resorts – the sale of alcohol to the Maldives’ native Muslim population is prohibited – it also incurs a 6o per cent import levy. Some resorts have discount drinking plans for those who can’t live on holiday without a daily tipple, but all cater for the oenophile or the consumer of fine aperitifs or digestifs. You won’t find so many Americans, but there are plenty of Brits, Italians, Aussies, Chinese, Russians, Arabs and Indians. Restaurant menus tend to reflect this eclectic mix. Contrary to the suggestion that the Maldives are just a fly-and-flop beach destination, there is no shortage of things to do. Every resort has its spa, usually overwater (though there is at least one underwater spa that doubles as a mini-aquarium). The menus of treatments are both extensive and inventive, and most therapists have learned their skills in Thailand or Indonesia. The Maldives are excellent for surfing. They may not produce the high and heavy waves that attract the most extreme of thrill-seekers, but for those trying a reef break for the first time the islands’ regular swells of between two and three feet are not too intimidating. Snorkelling in the Maldives is a delight – even the least practised snorkeller will have an enjoyable time. The house reef of each resort, only a few yards from the shore, is usually teeming with marine life: there are 1,000 species of fish in the Maldives, around 20 species of coral, and more than 400 species of mollusc. Most resorts offer guided snorkelling as well as scuba diving. A guided snorkel is preferable to snorkelling on your own, at least to start with, because your guide can take you to the best places (with gentler currents) and can point out passing fish that you might otherwise miss – perhaps a reef shark darting past (don’t worry: none of the sharks in the Maldives is a danger) or a turtle. Some islands are more family-friendly, some are geared towards honeymooning couples, some are closer to sites where you can swim with rays or whale sharks at particular times of year. One resort has a mini-observatory for star-gazing, while another has a year-round, overwater artificial ice rink (go figure). For those unable to break their umbilical connection to the outside world, broadband wi-fi is practically universal, as are satellite news and entertainment options. Most of the leading resorts now offer private residences – enormous overwater bungalows or beach villas or treehouses (with elevated pools) – which can accommodate bodyguards and nannies and afford greater privacy. Just the thing for a rock or movie star or titan of industry seeking peace and solitude.